Perfect for fans of Nancy Drew! Twelve-year-old Samantha Wolf and her best friend Ally are excited to spend part of their summer break in the mountains of Montana. But unbeknownst to them, Hollow Inn is bathed in mystery and legend. After arriving, the girls soon discover that things are not going well for Sam&apos;s Aunt and Uncle, who own the Inn. With ghostly sightings and rumors of lost treasures, they are determined to help save the business and perhaps solve a generations-old mystery. 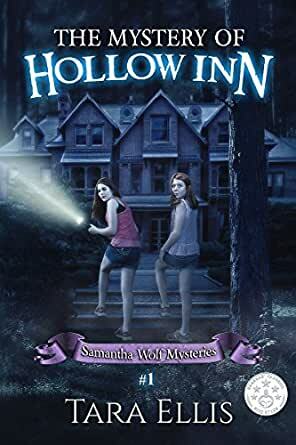 Read the whole Samantha Wolf Mysteries series, now an Amazon bestseller! WINNER! 2016 - The Gertrude Warner Mystery Chanticleer Book Award! Author Tara Ellis lives in a small town in beautiful Washington State, in the Pacific Northwest. She enjoys the quiet lifestyle with her two teenage kids, and several dogs. Tara was a firefighter/EMT, and worked in the medical field for many years. She now concentrates on family, photography, and writing middle grade and young adult novels. Young Samantha, along with her friend, go to visit her aunt and uncle at their Inn in the mountains. Things are not going well at the Inn due to vandalism and rumours of ghosts. Then there is the legend of buried gold...the young girls decide that if they can find the gold, they can help her aunt and uncle save the ailing Inn. This is the first book I’ve read/listened to by this author. This is a good kids story. I would like to listen to more of these books. The mystery was engaging and characters enjoyable. The author narrated the book and this is the first book I’ve listened to by her. I would listen to another. He did a fantastic job creating voices for each character, bringing l the story and instilling the mystery and excitement. I always pre-read the books I pick to read with my GrandKids. This one made the cut in spades. My youngest is in first grade and surprised me with how strongly she grabbed the story and the characters. I'd already mentioned that I also had a second book from the series. When we finished it she started into one of her "ready-set-go" attitudes, and we've now started into the second in the series. Thanks Tara for a good story and a most enjoyable fire you've ignited in a young girl that has moved reading with GramPa to more than just being on the receiving end of his attention. 5.0 out of 5 starsExcellent job! This was an excellent middle grade or preteen book! A great mystery with lots of clues, brave girls and a boy. Good vs evil. Happy ending. Suspense, intrigue, action, and dialogue that sounded real. I have eight grand kids and six are in this age level and I think they would love this book! The author is very talented besides being a crafty storyteller, she also narrated this book. Not everyone can do narration but she was awesome! I didn't know it was her until I checked after. Wow, awesome job! She did the voices so well. Men, women, boys, girls, all great! Technically, I gave it three and a half stars but rounded up. Visiting her Aunt and Uncle on break with her best friend, Sam soon finds herself deep in a mystery. Something has been haunting the inn her Uncle runs. What’s worse is it’s driving all the customers away, but beneath the stories is a true tale of gold, and Sam is determined to find it. The writing in the book was lower and acceptable for the grade level. I’d have to say it fits anyone in third or fourth grade. Any higher and they might not find some of the dialogue believable, as I did many times. The worst part of the writing—and probably one of the deciding factors for the lower grade—is the story is all written in present tense. I’m not sure why the author decided to do so. Most stories of this nature are past tense, and combine it with the dialogue, along with some of the explanatory chunks, especially at the beginning, and everything starts going south. Some authors can pull this off, and when they do, it is sparkling. However, here it just sags and is disruptive. As for characters, Sam and Ally come across as loveable little girls, but as they are mentioned as being ‘pre-teen,’ I don’t see their actions or behavior as believable as I would like. Also, little is done to develop their characters. By the end, I still had no distinct line in my head to which was which. I pretty much allotted them to the ‘main girls’ group—the ones we are supposed to rout for. Besides that, I didn’t feel a difference between them, except for maybe Ally liked her phone a lot—if that is a character trait. I liked the structure for the most part. It dove into the mystery quickly, added wonderful details to the backstory along the way, and had hidden twists and turns, overall. Still I’d have to say I wasn’t impressed with the flow. Many of the events happened by pure coincidence, which when it comes to stories is rather off-putting. If something happens, I want the characters to figure it out or cause it. In the end, even the bad guy was labored, and the reveal uneventful. If you’ve read the above critique, you may be wondering why I gave this four stars at all. Well, it had the bones of something good. Had the author switched the tenses, it would’ve been a tighter story. I hope with the following adventures (it is a series), the author puts more thought and planning into the events of the plot. Far too often while I was reading, I felt like I was watching an episode of Scooby Doo, especially in the end. All I was waiting for was the bad guy to say, “And I would’ve gotten away with it too, if it weren’t for those meddling girls,”—which actually, he kind of did. This is a delightful first mystery chapter book for ages ten-plus. I must admit, I did cringe a bit when Sam and Ally ignored the instructions of the adults. What kid doesn't? The cave scene is one that will truly make kids think twice before disobeying their elders the next time. Tara Ellis has spun a perfect read for the young sleuth. The book is filled with clues and intrigue. Just when you think you've figured out the ghostly sightings, everything changes. I had some difficulty with the present tense used, but it's definitely a book I'll share with my granddaughter. It's nice to see a mystery that explores the concept of fidelity to one's family.